Mercure Nadi Hotel is is set within 5 acres of beautiful tropical gardens and is only 3 minutes from the airport and 5 minutes from the town centre. The hotel features 85 rooms in two accommodation wings that overlook a stylish swimming pool, beautiful tropical gardens and the day spa. There is also a restaurant where you can enjoy al fresco dining on the poolside deck, as well as a relaxing bar. 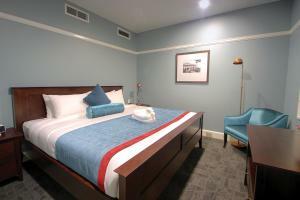 Hotel Mercure Nadi Fiji is located close to all major tourist attractions in Fiji, including beaches, parks, gardens, golf courses, shopping, markets, theatres, cinemas, cafes and restaurants. Guests can also enjoy island day trips, as the hotel is close to the ferry terminal. Union Pay is accepted at this property. 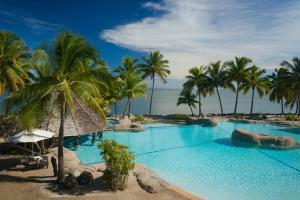 Volivoli Beach, on the main island of Fiji, offers private accommodation with panoramic beach and ocean views. It benefits from many leisure activities including diving, snorkeling and fishing. Leisure facilities available in the surrounding area including windsurfing and canoeing. Volivoli also has an outdoor swimming pool with a large sun bathing terrace. All rooms and studios at Volivoli Beach Resort include an electric kettle, air-conditioning and a private balcony with ocean views. Just 10 minutes drive from Nadi International Airport, Novotel Nadi features a swimming pool and 9-hole golf course, set on 42 acres of tropical gardens. All rooms offer a private balcony with lovely garden views. The air-conditioned rooms have satellite TV, a refrigerator and tea and coffee maker. 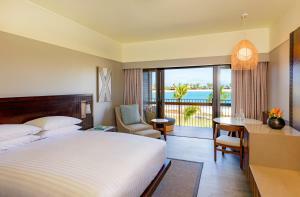 Each spacious room features traditional Fijian décor, including high ceilings. 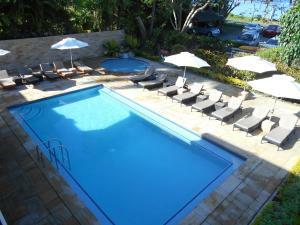 Nadi Novotel Hotel is 10 minutes’ drive from the Nadi town centre, with its local shopping, markets, bars and cafés. Port Denerau is a 15-minute drive away. 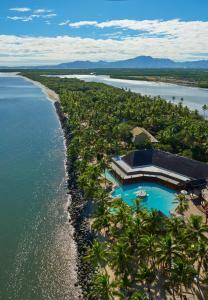 Leisure facilities at the Nadi Novotel include a tennis court and an indoor games room. Senikai Spa offers a range of facial and body treatments. Free parking is available on site. Talei Restaurant offers an à la carte menu featuring international cuisine. Talei Bar is the perfect place to relax with a refreshing cocktail in the beautiful gardens. Just a 7-minute drive from Nadi International Airport, Capricorn International Hotel offers a freshwater swimming pool and free airport transfers. Satellite TV and air conditioning are standard in all rooms. 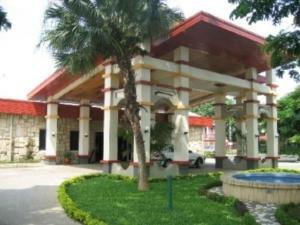 Capricorn International Hotel Nadi is just 3 minutes’ drive from Nadi Shopping Centre and the famous Sri Siva Subramaniya Temple. Free parking is available on site. The bright and airy rooms include a refrigerator and tea and coffee maker. Most rooms also feature lovely views of the pool and garden. Guests can enjoy a relaxing massage, or buy a special souvenir at the gift shop. The tour desk can arrange cruises and day trips around the islands. 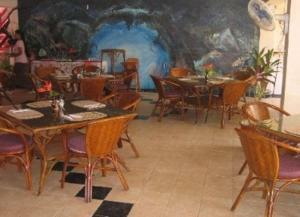 The restaurant offers delicious local and international cuisine, including European, Indian, Fijian and Asian dishes. The poolside bar offers a wide range of exotic cocktails. 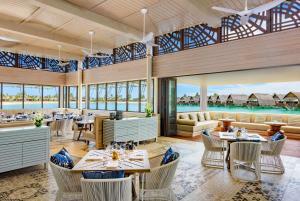 The renovated DoubleTree Resort by Hilton Fiji is situated on the Coral Coast, which is the 49.7 miles stretch of beach between Nadi and Suva. All beachfront rooms offer stunning ocean views. It is a 3-minute boat ride from the main island of Viti Levu and a 25-minute drive from Nadi International AirportYou can spend the day relaxing by the lagoon pool, or exploring the tranquil grounds. Guests can choose enjoy an array of on-site activities including paintball, horse riding and spa treatments. 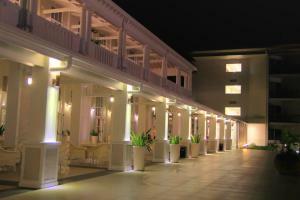 The property boasts 3 bars and a restaurant where you can sample a variety of cuisines inspired by local produce. 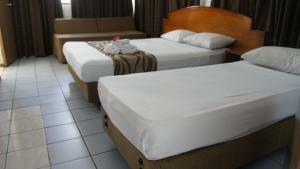 All rooms include satellite TV and a signature Sweet Dreams by DoubleTree bed. Tea/coffee making facilities, mini refrigerator and a seating area are also provided. 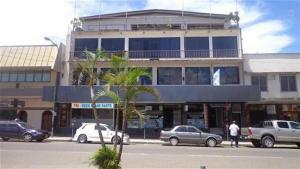 Situated in the heart of Nadi, on Fiji's main island, Nadi Downtown Hotel and Backpackers offers a 24-hour reception and airport shuttle. 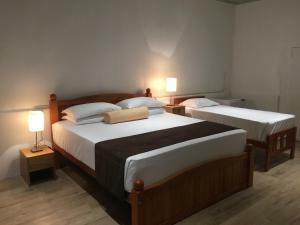 Guests can choose from private or dormitory-style rooms. The simply furnished rooms all have air conditioning. All rooms are stocked with linen and towels and some offer private bathrooms. 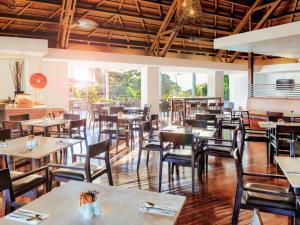 As well as a restaurant and bar, Nadi Downtown Hotel offers barbecue facilities. Complimentary coffee, served each morning and afternoon, can be enjoyed in the garden. 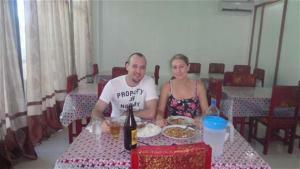 Nadi Downtown Backpackers is an ideal home base guests who want to visit the Yasawa and Mamanuca Islands. 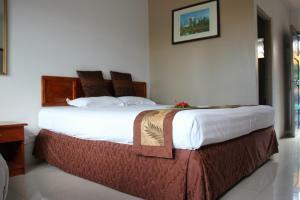 Nadi Airport is approximately 10 minutes' from the hotel and free onsite parking is available. 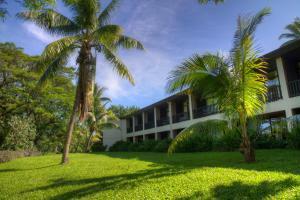 Holiday Inn Suva is an oasis of calm within 5 minutes' walk of the city’s business district. It offers lush tropical gardens, an outdoor pool with sun terrace, and ocean views. All air-conditioned rooms at Suva Holiday Inn feature satellite TV, in-house movies, and a work desk with broadband internet access. Ironing facilities, a minibar and a private balcony are also provided. Guests have access to a fully equipped fitness centre and laundry facilities. The hotel’s business centre is available 24 hours a day. Free car parking is provided. Vikatoria's Restaurant offers an à la carte menu in a relaxed setting. The Tapa Lounge & Bar features live music overlooking the pool area. Coffee and other drinks are served at the hotel’s café.Holiday Inn Suva is a 5-minute walk from the EU headquarters, Fiji Museum and Thurston Gardens. Colo-i-Suva's rainforest trails and waterfalls are 15 minutes' drive away. Less than 10 minutes drive from Nadi Airport, Tanoa International Hotel offers rooms with private balcony overlooking tropical gardens. 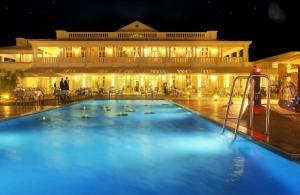 Facilities include a restaurant and outdoor pool. 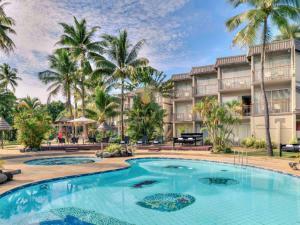 Each room at Tanoa International Hotel Fiji includes flat-screen cable TV, air conditioning and a refrigerator. Guests enjoy views of the gardens or mountains from the balcony. Guest facilities include an outdoor swimming pool with poolside bar, fitness centre and 2 tennis courts. There is also a sauna, hot tub, children’s pool and massage clinic. Wi-Fi access is available. Tanoa International's Fresh Restaurant is open from 11:00 until 21:00 daily and serves hand stretched pizzas, cooked in a traditional pizza oven. It also serves mouth watering skewers from the traditional Indian tandoor oven. 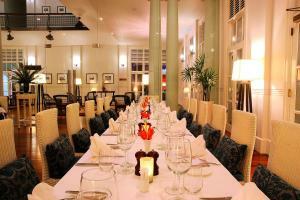 Garden Court Restaurant is open 24 hours a day. The bar is open until late and hosts nightly musical performances. Free airport transfers and free car parking are provided. The tour desk can arrange local activities. Located opposite the Lagoon Beach coral reef, Bedarra Beach Inn features a restaurant with live Fijian music and an outdoor pool set amongst tropical gardens. Free snorkelling equipment and kayaks are available for guest use. Bedarra Beach Inn Fiji is located on the Coral Coast, 9.3 miles from Sigatoka Sand Dunes National Park and 12.4 miles from Sigatoka Valley. Nadi International Airport is 31.1 miles away. The bright and airy rooms include air conditioning and a spacious seating area. 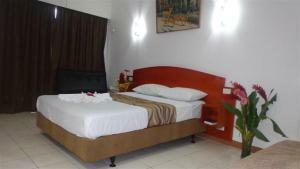 Each room has a refrigerator and tea and coffee making facilities, and some rooms also have a balcony with ocean views. The poolside restaurant offers casual dining. 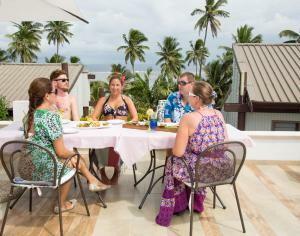 Ocean Terrace Restaurant serves local and international cuisine on the verandah with views of the pool and lagoon. 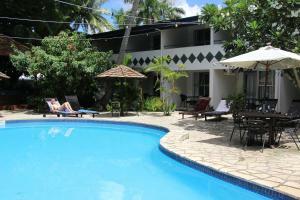 Guests can relax in the sun loungers on the beachfront gardens, or snorkel in the coral reef. A traditional 'kava ceremony' is held twice a week. The tour desk can arrange day trips and watersports activities. 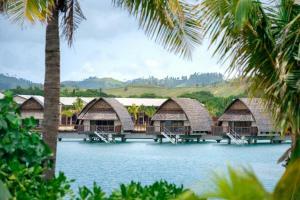 Fiji Marriott Resort Momi Bay is an international luxury hotel located in Momi Bay, Fiji. The resort offers unrivaled lagoon and ocean views guest rooms including exclusive overwater Bure Villas, in a serene setting, providing you with an elegant, island-inspired experience. All rooms have a flat-screen TV, seating area where you can relax, and kettles in the room. Every room comes with a private bathroom. Extras include bathrobes and slippers. 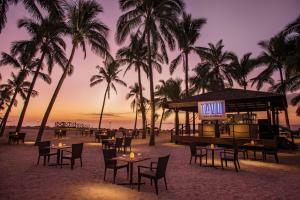 Highlights of this resort include 4 dining options, 3 large swimming pools, and private white-sand beach access. You can engage in various activities, such as a spa, health club, children's playground and water sports including snorkeling and diving. You will find a 24-hour front desk at the property. 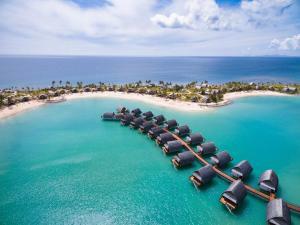 Nadi is 18 miles from Fiji Marriott Resort Momi Bay, while Denarau is 19.9 miles away. The nearest airport is Nadi Airport, 21.7 miles from the property. Situated along the lively Sunset Strip and only a street away from its private beach, Crows Nest Resort boasts self-contained spacious villas and suites with ocean views. The property offers an array of activities including fishing, kayaking, snorkeling, and crab racing. The onsite swimming pool is perfect for a dip. Villas and suites are set up on split level with a Queen-size bed upstairs and 2 single beds downstairs. Featuring wooden flooring and big windows offering plenty of sunlight, they are fitted with a TV, a fridge and coffee/tea facilities. The villas come with a kitchen with cooking stoves. Guests can ask for spa treatments or various tours at an extra charge. Nature activities like diving, water-skiing and rafting can be enjoyed, as well. The property has a large garden, a playground and volleyball courts outside. Other activities include musical chairs, stick dance, and reef walking along the resort beachfront. Nadi International Airport is a 1-hour drive away, and chargeable direct shuttles are provided. Sigatoka Town is an 8-minute drive away, while Kula Eco Park is located within a 3-minute drive. 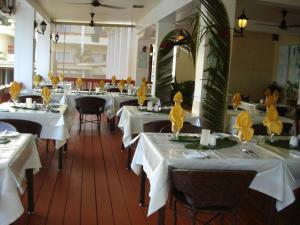 Quarter Deck Bar and Restaurant offers variety of cuisines and refreshments. The outdoor deck offers great views of the ocean. Guests can enjoy 'happy hour' drinks every evening between 5pm until 6.30pm.